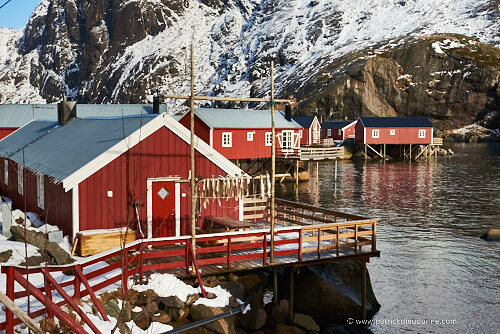 A new photo tour in the Lofoten Islands, a fantastic archipelago north of Norway. Three 8-days tours led by Patrick Dieudonne, professional photographer, in partnership with a well-known french travel agency, for online reservations and logistics. This tour has been prepared carefully to provide you with the best photographic opportunities in winter. We will enjoy superb mountain scenery by the sea and traditional fishermen villages in beautiful settings, with also very good opportunities for the northern lights at night at this season. 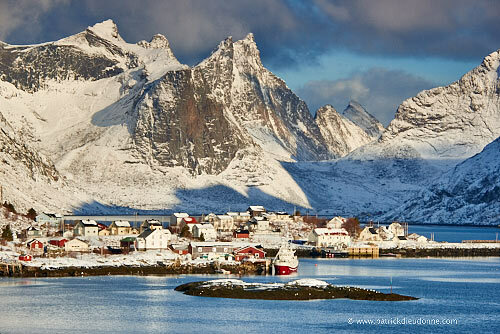 We will be based near the prettiest village in the Lofotens, Reine, in a rorbu, typical fisherman's house. 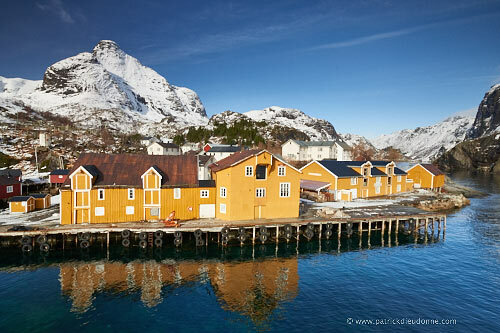 This is in my opinion the best moment to discover the Norwegian Lofotens, in a season where the light is back in the northern regions, and where the temperature is generally moderate (-5 ° to + 3 ° C during the day, usually), thanks to the presence of the Gulf Stream nearby. NB: Small groups of 5-7 photographers (+ guide) on this trip. This new photo tour will take you to a truly enchanting world: sharp mountains pitched into the sea, cod fishermen small villages painted in red (rorbuer) and above all startling lights, either day (with sun low on the horizon, but already well present), or night (with Northern Lights if the sky is clear). A journey in March, the best time of year, guarantees the presence of snow on the mountains, enough light during the day (approximately half of the day), and generally fresh snow on the ground at sea level also. This is a must for the landscape photographer. Indeed, March is the most snowy month in the Lofotens, with often very spectacular skies when snow storms approach. I visited this region in summer and winter and I must say that winter is the best moment photographically speaking, even if the season doesn’t permit long hikes, the main attraction in summer (but then the tourist presence is often too strong). Of course you have to be well equipped against the cold and wind, but it is no polar expedition. The Lofoten Islands, despite their high latitude, enjoy, under the Gulf Stream influence, a moderate climate, winter included. A this season Norwegians also fish the large cod banks that come to spawn in numbers near the coast. The fish is dried on racks, outdoor and near the houses, which offers great opportunities for typical pictures. Temperatures in March at sea level are generally in the range of minus 5 to +3 °C (but we must take account of the wind). Based in a traditional house, with modern comfort, in Moskenes island, we will explore the essential Lofotens, and probably will have the chance to get the northern lights at night, from our doorstep or elsewhere. Sessions of photo critic and advanced post-processing are also in the program, which can be adapted according to the weather. Throughout this photo tour we will also learn how to handle the peculiarities of landscape photography in winter, with the use of graduated neutral density grey filters. Panoramic photography (stitched panoramic) is also a great way to do justice to the scale of the norwegian landscapes, sometimes too cramped in the classic 2/3 format. 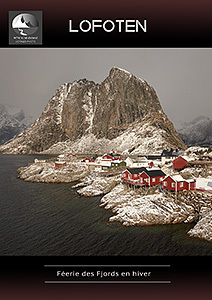 This photo trip in winter to the Lofoten islands is guided in french (and english) by Patrick Dieudonné, pro photographer. In partnership with 66° nord, a well-known french travel agency. Supplement for single room: please ask. Day 2-7 Photography in various places in Lofoten, first around Reine, which offers beautiful landscapes, traditional architecture and a good overview of Lofoten traditional way of life, very dependent on cod fishing, but also further north, in the nearby islands. Each island has its special character, and road access is very good, allowing access to spectacular views in many places, either directly or after short walks. Villages and photogenic fishing towns abound, beaches surrounded by snow-capped mountains are beautiful and all different. We visit the main islands of Moskenes, Vestvagoy Flakstadoy, and smaller satellite islands. Day 7After a full day of photography, we take the Hurtigruten ferry from Svolvaer to Bodo in the evening, to avoid any potential problems with flights in case of bad weather. Night at hotel in Bodo, departure J8 (Friday) from Bodo airport around 12.00. Day 8Departure J8 (Friday) from Bodo airport around 12.00. • Land transport (vehicle adapted to winter). • Accommodation, in traditional house, comfort. A good level of fitness is required.This trip in winter to Norway is a bit more physically demanding than our other trips. Walks of moderate level are possible. You should therefore be able to adapt to these conditions and be in good general fitness for a duration of 8 days. 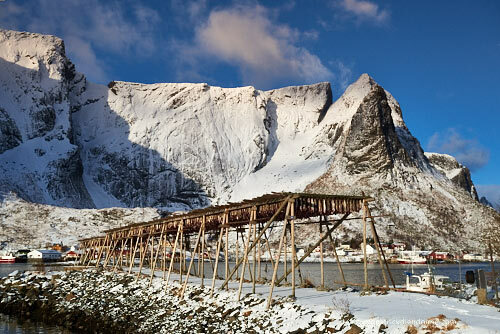 Clothing: The climate in the Lofoten in winter can be difficult. So take windproof and breathable Goretex and layers of warmer clothes. Woolen hats and gloves, waterproof and breathable pants. • Accommodation: Accommodation will be in traditional house, fully equipped with kitchen, etc. • Meals: Usually meals taken at home (breakfasts and dinners), a little cooperation is needed in the preparation of food (local products where available). When on site for a day we will use small restaurants or equivalent in the vicinity. • Transportation: We'll use a hired car adapted to winter conditions, normally a 9 seater for a group of 6-7.